Anagrams have been something of a minor leitmotif in twentieth-century literary theory. Saussurean linguistics may have been formative for mainstream structuralism, but it was Saussure’s later, unpublished work devoted to proving that Latin poets deliberately concealed anagrams of proper names in their verses that appealed to theorists of a more post-structural bent. And Walter Benjamin’s friend Gerschom Scholem has informed us that the German Marxist theorist’s ‘taste for anagrams accompanied him through his whole life. It was one of his main pleasures to make up anagrams. In several of his essays he used the anagram Anni M. Bie instead of the name Benjamin’. So I am very struck by a peculiar formulation in Morris’s poem ‘King Arthur’s Tomb’. Riding towards Glastonbury, Launcelot refers to his beloved Guenevere as ‘her whose name-letters make me leap’ (l.72). Name-letters? Has he then been passing the dreary hours on horseback by concocting anagrams of her name, ‘leaping’ excitedly whenever he comes up with one; and if so, what possibilities are there here? I’ve come up with the three-word phrase ‘gun ere eve’, which is thoroughly anachronistic in the Arthurian world of Morris’s early poems; but there could also be a character called Rev. E.E. Nuge. Or should we be thinking of ‘Queen Guenevere’ to extend the linguistic opportunities here? And could we then perhaps apply an anagrammatic hermeneutic more widely to Morris’s poetry, looking, in a Saussurean spirit, for anagrams of his own name or those of his Oxford friends scattered across the texts of these early works? All very interesting, but as a first test of your method how about pulling a couple of anagrams of Jane Burden out of Morris's early poem 'Praise of my Lady'? Can it be done? 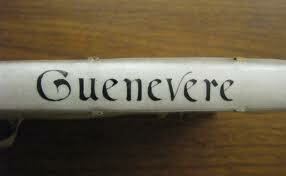 I think maybe he jumped at the word-letters because 'Guenevere' rearranges to 'Revenge' with only two spare letters! This has been a fun exercise, thank you. Sadly I didn't find anything too likely in the early prose Romances that I checked, but I'll keep my eye out. Dear all, thanks for various suggestions (and challenges). I particularly like the Guenevere/revenge idea - after all, she does give Launcelot a very hard time at the end of that poem! Have just been re-reading T.S. Eliot's 'Gerontion', which contains the line: 'The word within a word, unable to speak a word', which sounds like a good description of an anagram to me.